Threshing the Wheat Photo Picture Classic Cars for sale & Classifieds - Buy Sell Classic Car & Classic Truck Classifieds. 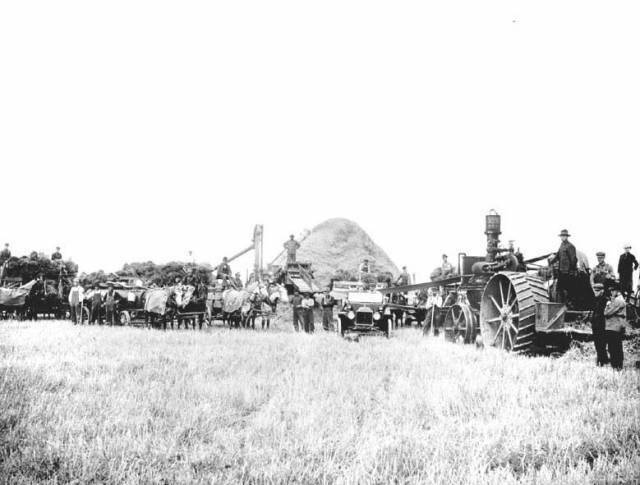 This photo was taken at a time when farm people worked together. That old tractor is running a thrashing machine. In those days, a reaper cut the grain (oats or wheat) and a thrasher separated the seed from the chaff. The invention of a machine to do both steps, combined the reaping and thrashing. It was called, (big surprise) a combine. That's a Model T next to the tractor. I don know my old tractors well enough to know what kind it is.